February 23, 2013 — The Nordica Trio performed a concert at Nordica Auditorium on the campus of the University of Maine at Farmington sponsored by the Arts Institute of Western Maine. The trio performed works by Vanhall, Bartok, Mozart and Schumann. The varied program included works for violin, clarinet and piano as well as for viola, clarinet and piano. This concert of widely varying styles took place at 7:30 in the evening. Tickets: $12 at the door. UMF students and under 18: free. April 2 and 3, 2012 — The Nordica Trio performed a series of concerts in Mt. Blue RSU 9 school district sponsored by the Kingfield Pops. The trio performed a lively concert focusing on the idea of dance inspired music for elementary, middle school and high school students in the district. 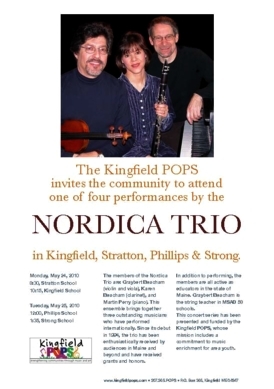 May 17 and 18, 2011 — The Nordica Trio performed a series of concerts in Mt. Blue RSU 9 school district sponsored by the Kingfield Pops. 4 concerts were performed during these two days for the elementary students in the district. The concerts were well received by all, and many interesting and insightful questions were taken from each group of students by the members of the trio. One of the unique benefits of educational concerts offered by the Nordica Trio is the ability (with only three members) to demonstrate instruments from the string, woodwind and percussion families. 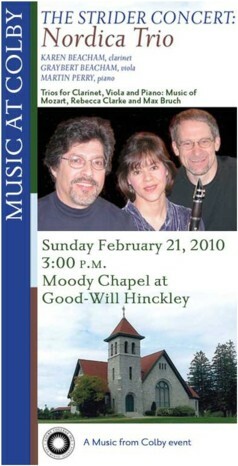 February 20, 2010 — The Nordica Trio performed a concert for the Arts Institute of Western Maine. The program took place at 7:30 p.m. in Nordica Auditorium on the campus of the University of Maine at Farmington and featured works for Clarinet, Viola and Piano. The program included a performance of Mozart's "Kegelstatt" Trio. Pianist Martin Perry and violist Graybert Beacham performed the "Sonata for Viola and Piano" (1919) by Rebecca Clarke. Mr. Perry played the orchestral reduction for a performance of the delightfully tuneful "Concerto for Clarinet and Viola" by Max Bruch. September 22, 2007 at 7:30 p.m. — The Nordica Trio performed as part of the Colby College Concert Series in Lorimer Chapel on the Colby College Campus. Their diverse program included works by Australian composer Peter Sculthorpe, Aram Khachaturian, Ernest Bloch, Francis Poulenc and Paul Schoenfield. Peter Sculthorpe's "From Nourlangie" is a representation of sites in the Kakadu National Park in Australia. Khachaturian's colorful trio was written in 1932 and is his only complete chamber music work. Its material springs from Armenian folk music; complete with florid, improvisational embellishments, and includes variations on a folk tune from Uzbekistan as the final movement. The concert concluded with a performance of the trio by American composer Paul Schoenfield (written in 1990), which realizes his long-standing desire "to create entertaining music that could be played at Hassidic gatherings as well as in the concert hall". August 23, 2007 at 8:00 p.m. — Concert for "Society for the Preservation of the Free Will Baptist Church" in Islesboro, ME. The church was built in 1843 and is now on the National Historic Register. Islesboro is an island about 3 miles offshore from Lincolnville Beach. Come to the concert on Thursday night and stay for an extended weekend in one of Islesboro's fine B & B's (Aunt Laura's B & B at 207-734-8286, The Village B & B at 207-734-9772, or The Dark Harbor House at 207-734-6669). Please be advised that you should book rooms early to insure availability. Tickets are available at the door. For further information and advance tickets, please contact Roger Heinen at 207-734-8298, PO Box 162, Islesboro, ME 04848, or e-mail Cynthia Howland, Chair of the Concert Committee. March 3, 2007 at 7:30 p.m. — World Premiere of Jonathan Hallstrom's "In the Swallow's Space", written for the Nordica Trio. The concert also included other works by Jonathan Hallstrom. Dr. Hallstrom is Associate Professor of Music at Colby College. This concert was free and open to the public and took place in Lorimer Chapel on the Colby College campus. Please click here for a Colby College Campus Map. For further information about concerts at Colby College, please call 207-859-5670 (Colby College Music Department). December 31, 2006, 12:30-4:30 p.m. — Karen Beacham, clarinet, performed as soloist with the Al Corey Big Band at the August Civic Center's North Wing Ballroom. This benefit/dance/buffet was billed as "Midnight in Moscow", since 4:00 p.m. EST is midnight there. This event was one of the "Concerts at Jewett" series presented by the University of Maine at Augusta College of Arts and Humanities and Senior College. December 10, 2006 at 2:00 p.m. — The Nordica Trio performed a concert in North Conway, NH at the First Church of Christ, Congregational. This concert was under the auspices of the White Mountain Musical Arts Chamber Music Concert Series. Repertoire included Mozart's "Kegelstatt" Trio, Rebecca Clarke's Sonata for Viola and Piano and Nos. 2, 6, and 7 from Max Bruch's Eight Pieces for Clarinet, Viola and Piano, Op.83. In addition, the trio performed holiday selections from "The Nutcracker". For further information about their concert series, please e-mail White Mountain Musical Arts or call 603-447-8914. May 14, 2006 — The Nordica Trio performed a concert for the Arts Institute of Western Maine. The trio donated their fee for this concert to an instrument fund for the purchase of beginning band instruments for the SAD #9 Music Department. The concert took place on May 14, 2006, at 3:00 PM in Nordica Auditorium in Merrill Hall (224 Main Street) on the University of Maine campus in Farmington and raised almost $1300. April 9, 2006 — The Nordica Trio performed in Jewett Auditorium on the University of Maine at Augusta campus. The Nordica Trio performed in this series last year and returned with a varied program. Trios by Jan Vanhall, Darius Milhaud, and Paul Schoenfield were performed. In addition, Cheryl and Karen performed the Sonata for Clarinet and Piano by Leonard Bernstein. February 12, 2006 — Karen Beacham, clarinet, performed in the Third Sundays at Jewett concert series at the University of Maine at Augusta with the DaPonte String Quartet. Nordica Trio's esteemed clarinetist performed Mozart's Clarinet Quintet. January 26, 2006 — The Nordica Trio performed works by Vanhall and Martinu with guest flutist Lee Humphreys as part of the Portland Conservatory of Music Noonday Concert at the First Parish Church, 425 Congress St., Portland, Maine. September 2006 — The Nordica Trio was listed throughout the month of September on MatchBook.org as one of the groups In the Spotlight. MatchBook.org is a public service provided by New England Foundation for the Arts and the Massachusetts Cultural Council, in partnership with the state arts agencies of Connecticut, Maine, New Hampshire, Rhode Island, and Vermont. In January 2008, Graybert & Karen Beacham spent the month in Kalimpong, West Bengal, India teaching at the Gandhi Ashram School. They also played concerts in Delhi; at the Delhi School of Music, and the American Centre (at the American Embassy). Please visit our India Blog for more information about the trip (including photos). 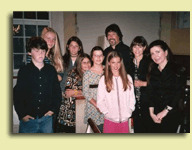 Pictured above, the members of the trio spent some time answering questions and talking with a group of music students from Islesboro who attended the August 23, 2007 concert. (Click on image for a larger view). July 2006 — Graybert Beacham, Cheryl Tschanz, and guest cellist Susan Poliacik recorded "Divertimento" by Maine composer Peter Ré for Albany Records. The CD was released in July 2006 and the performance of "Divertimento" accompanies the recording of three string quartets by Peter Ré with the Portland String Quartet. May 2006 — This concert was performed as a benefit for the Maine School Administrative District #9 Music Department and raised almost $1300 to be used toward the purchase of beginning band instruments!